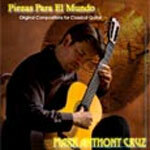 The first of a three CD series, this particular recording is the third all-original solo project by Cruz. The 2nd movement from Dichotomy No. 1 uses a daring blend of rondo form and theme and variations. 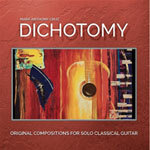 Dichotomy No. 2 was commissioned by guitar aficionado, Martin Olson, and features a Turina/Impressionistic inspired Prelude. Five Pieces in C is a light musical family portrait using like harmonic elements for unification among the movements. Tempus Fugit is a capricious guitar duet composed for the Hanser-McClellan duo. Triduum was commissioned by Brett Floyd and is a programmatic work based on the last three days of Christ—the unusual dissonant tuning for this piece underscores the weight of topic. This is the second CD in Cruz's series of original compositions. 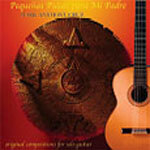 Featured on the internationally syndicated radio show .Classical Guitar Alive' only two weeks after its release, Piezas Para El Mundo is sure to satisfy the critical ear and captivate the attention of all who love classical guitar music. This CD includes traditional style compositions but also explores a fusion of modern style with classical structure and symmetrical melodies. It also includes Cruz's composition 'Questioning' (from The Portal) as published by Soundboard Magazine. This recording was inspired by Mark's brother, Edgar, who has released a series of remarkable cover tune recordings throughout his career. This recording features a blend of some of Mark's best rock transcriptions and arrangements from the Beatles to progressive. Notably, Queen's Love of My Life lends itself beautifully to the guitar with its neo-Romantic style reminiscent of a Schubert art song while Rush's, The Trees, is well developed with contrasting sections and odd meters. Cruz takes the most liberty with the opening U2 track by reinterpreting it as a ballad, incorporating new material and employing chord substitutions with a dash of impressionism..
As a young man, Mark was encouraged by his father to compose for the guitar. His father would also insist always write it down so that your work will not go to waste. 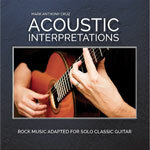 Twenty-five years after hearing his fathers words, Mark pays tribute to him in this collection of all-original solo guitar works influenced by Spanish, classical, baroque and tonal twentieth-century music. Fuzz is a collection of all-original contemporary jazz compositions. Unlike his solo guitar recordings, this CD captures Mark in rare form with his electric guitar performing funk, samba, traditional, ballads and rock influenced jazz. Mark is accompanied by Brian Gorrell on sax and keyboards, Mike Walker on drums, Todd Lawton on bass, Woody Lingle on bass, Victor Rook on bass and Gary Clardy on sax. Cruz's very first recording was a Christmas collection titled, In the Key of Christmas (1995). 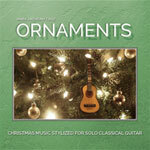 Time has given him the luxury of improving his Christmas catalog by expanding on existing interpretations while adding new ones to offer this new definitive solo guitar collection. 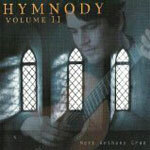 Finding his way back home after a long departure from classical music, Mark returns to his nylon stringed instrument and follows his spiritual urge to arrange hymns for solo guitar. All selections are well developed, creative and inspired works.